Rough surf hit Oahu&apos;s Waimea Bay near Haleiwa, Hawaii on Sunday as a strong storm hit the islands and knocked out power, brought down tree branches, flooded coastal roads — and even brought snow. The storm, which the National Weather Service office in Honolulu described as ‘‘historic,’’ first began pounding the islands Friday. Hawaii News Now reported a 66-year-old California man died in the rough surf off northwest Maui on Friday. ‘‘[Forecasters] are calling this an unprecedented event and we concur that we rarely if ever have seen the combination of record-high on-shore waves, coupled with gale force winds,’’ said Sam Lemmo, administrator of Hawaii’s Department of Land and Natural Resources. The storm’s most extreme blow was generated on the Big Island’s towering peak of Mauna Kea where a 191-miles-per-hour wind gust blasted the mountain summit at 4:40 p.m. local time Sunday. The visitor station on the 13,308 foot mountain is closed until Tuesday ‘‘due to the predicted continuation of severe weather,’’ according to the station’s website. The road is shut down whenever visibility drops below 50 feet, or winds gust to 65 miles per hour or greater. The storm even deposited a coating of snow at Kauai’s Polipoli State Park at an elevation of just 6,200 feet according to Hawaii’s DLNR. 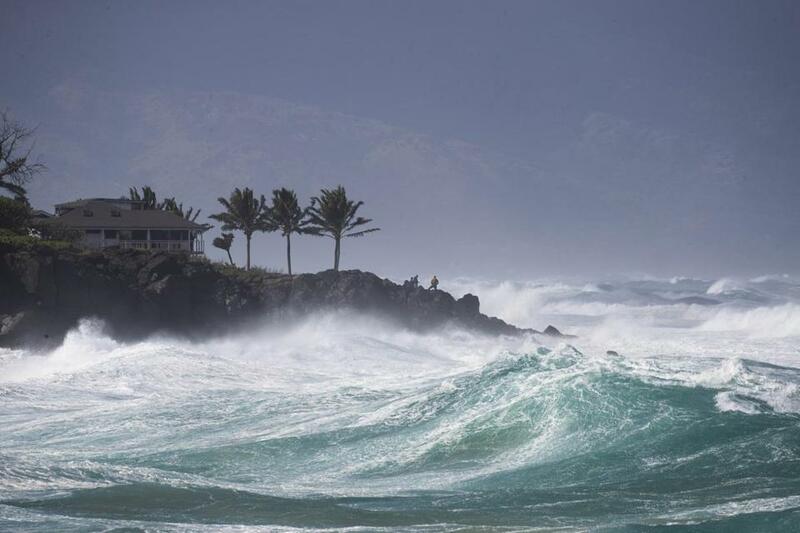 Wind gusts up to 67 miles per hour were clocked in the oceanside town of Port Allen in Kauai. The community resides on the south side of the island, protected from the harshest conditions streaming in out of the northeast. The National Weather Service had hoisted a high surf warning Thursday in anticipation of the event. It warned of ‘‘giant disorganized waves’’ that ‘‘could cause unprecedented coastal flooding Saturday night through Sunday.’’ Jelsema said his office had received numerous reports of road closures due to the coastal inundation. The harsh conditions were expected to begin to subside late Monday. The wind advisory in effect for the Big Island expired at noon local time. A high wind warning remained in effect until 6 p.m. local for the Big Island summits of Mauna Kea and Mauna Loa, where gusts still were expected to top 140 miles per hour before tapering down.